It’s been a while since sampling Welsh football; I must do it more often as its football and grounds are absolutely charming. There was a major restructure of top Welsh football this year with the top flight reducing from 18 teams down to 12. 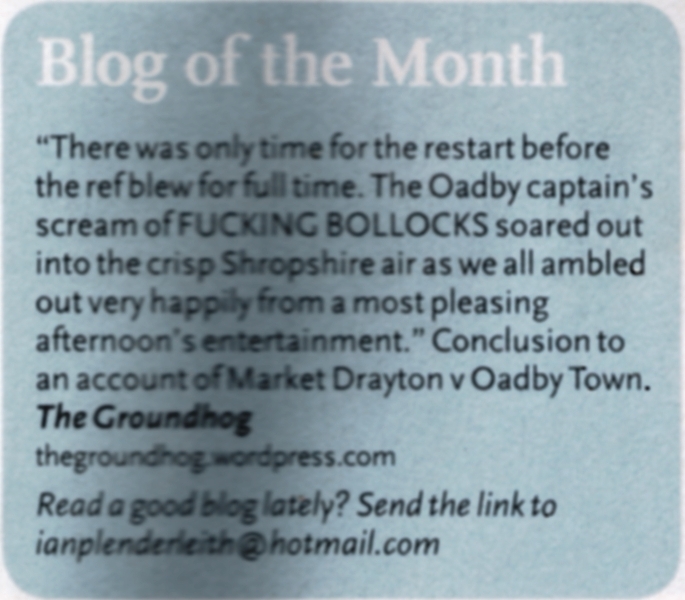 This had the effect of bolstering the northern second tier Cymru Alliance. 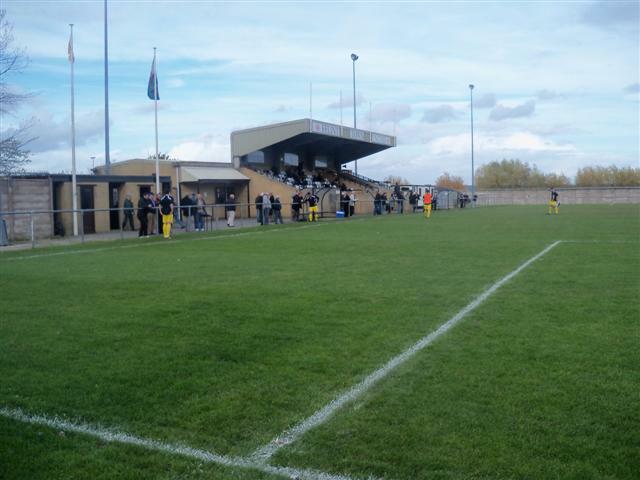 Connah’s Quay, Porthmadog, Welshpool Town, Caersws and Cefn Druids were relegated by finishing in the bottom places, with Rhyl relegated for failing ground criteria (despite finishing 6th). This makes the Cymru Alliance a league of vast contrast. You have the likes of Rhyl, who have played (and even won sometimes) European ties, with a smart ground with floodlights; and then you have teams such as the newly promoted Rhos Aelwyd (from Rhosllannerchrugog, near Wrexham) and Guilsfield, whose grounds have no floodlights and are little more than pitches. 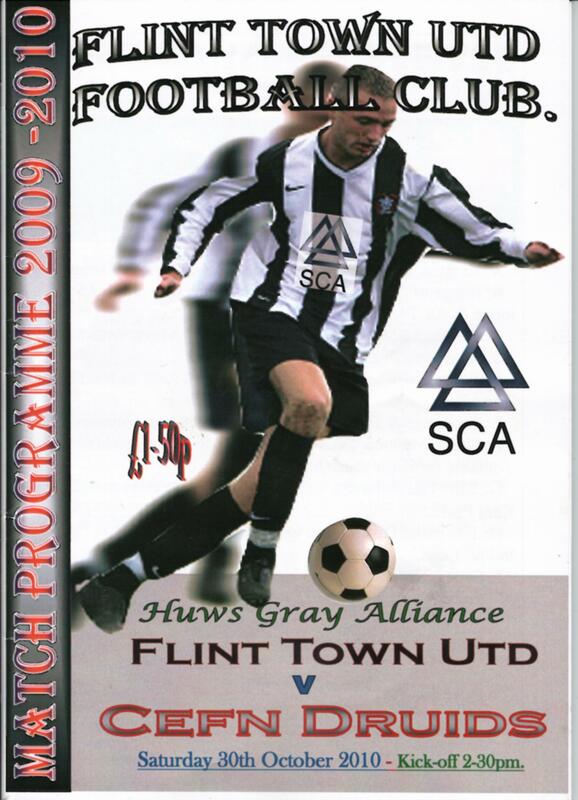 Flint Town United are a merger of Flint Town and Flint Athletic and date back to 1886. They won the Welsh Cup in 1954 against Chester. They were founder members of the League of Wales in 1992 but have played in the Cymru Alliance since 1998. Their ground, Cae-y-Castell, translates as the Castle Field, and is indeed situated right next to Flint Castle. They have the same nickname as Macclesfield – the Silkmen, due to their manufacuring history. The signage regarding the football team seems to switch alternatively between Welsh and English. On the entrance to the social club you have a neon Fflint Town (welsh spelling) sign surrounded by two turrets sporting Flint Social Club signs (English spelling). 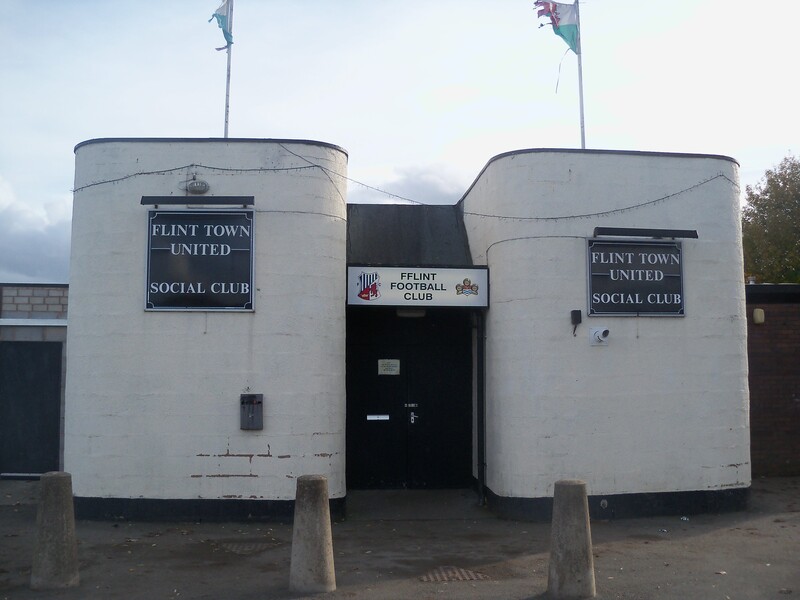 On the back of the main stand it says Flint Town United while on the from it reverts to Fflint Town United. The visitors today were the new league leaders Cefn Druids (the oldest Welsh football club, 1869). The f is pronounced as a v. They beat Connah’s Quay last weekend, 5-1, to depose them at the top. This is also their first season at ‘The Rock’, their new ground. I was looking forward to seeing a top of the table clash as Flint weren’t far behind them with five wins and three defeats so far. The ground is right on the Dee estuary, next to the old castle and Flint Rugby club. The main stand is a smart new affair housing roughly 200, and another stand sits, like a corner unit, down from the main stand seating three rows of 11 and one of 12, totally 45. There is no terracing as such, just hard standing around the rest of the ground. A small astropitch sits in one corner, where kids were playing throughout (and at one point their ball flew out on to the main pitch). 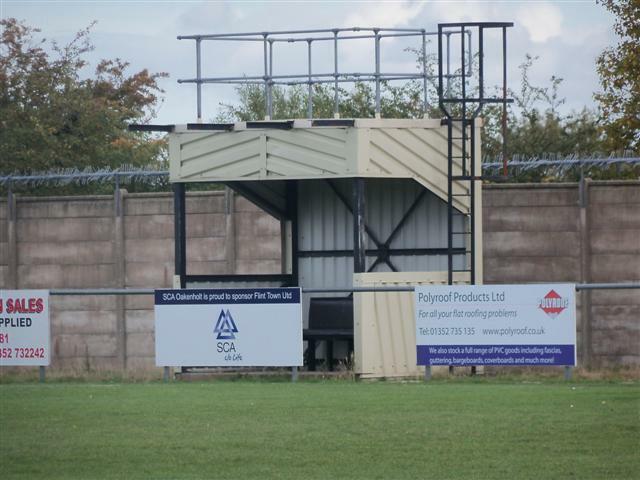 Opposite the main stand is what I guess is a TV gantry with a plush leather bench underneath. The match was a bit of a surprise. 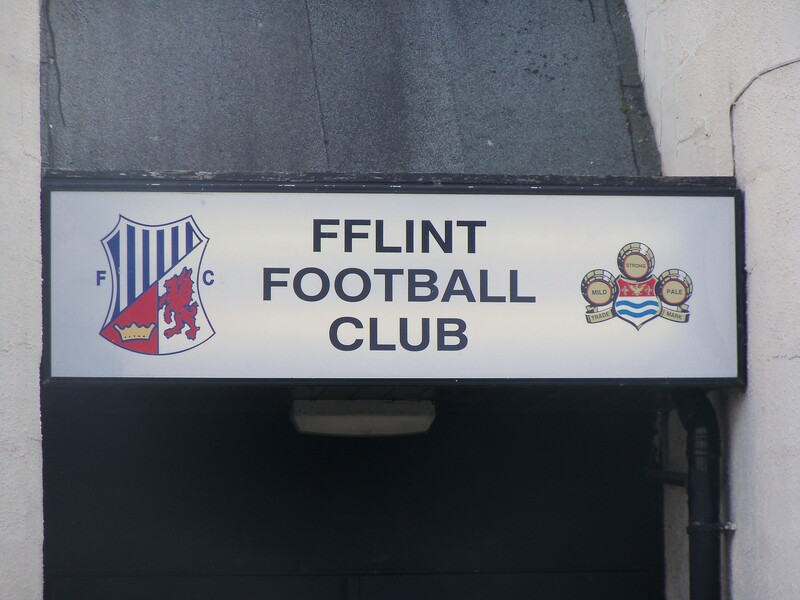 Flint Town completely dominated the first half and, but for some sloppy end play, should have been a few goals up. To compound to Druids struggles, they had a man sent off for kicking out late in the first half. Flint finally got a goal on 51 minutes when Beck hammered home from close range in to the top of the net. At 1-0 it always looked like Cefn Druids might sneak an equaliser, especially with them being top of the league, but Flint held out for a deserved win. Great ground and hospitality and a cracking game. 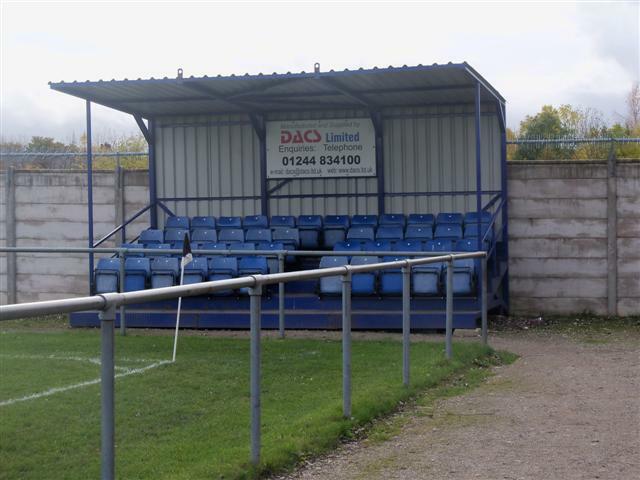 This entry was posted in Travelog, Welsh football and tagged Cae-y-Castell, Cefn Druids, cymru alliance, Flint Town United. Bookmark the permalink. Bonsoir les amis que pensez-vous de mon nouveau blog sur le diagnostic immobilier?